Due to a customers and website vistors feedback who asked us to show some samples, below you can find some of our projects. Please keep in mind, this are just samples only!! We can design and fit every van to YOUR needs and budget! 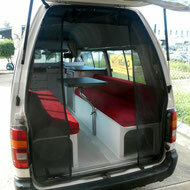 Modern versatile layout with features as: swivel front seats, additional bench seat to carry up to 4 people. 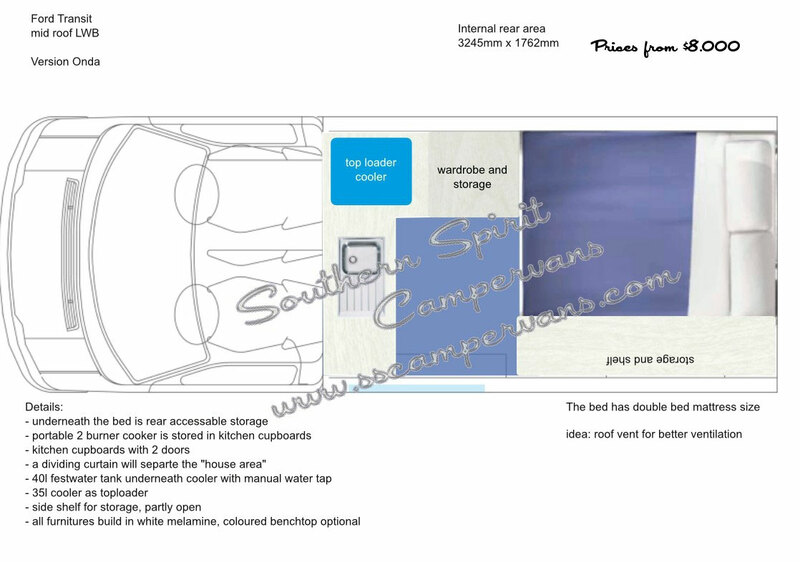 The asymetric bathroom is very spacy and the bed area is on a raised platform with internal accessable drawers and storage under the bed reachable from the rear of the van. Kitchen with pull out pantry. Overall enough storage and room for long trips. 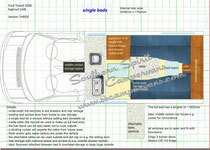 For some vans available: sliding door conversion to Caravan house door. Suitable for LWB vans like: Renault Master, Fiat Ducato, Ford Transit and Sprinters or Crafters. This layout was designed for a customer who requested lots of storage space. To house equipmet like a generator the permanent bed got raised up to a height of 65cm. From inside a chest of 3 drawers was underneath the bed and from the rear there was full access to more than 1180l storage space. The 2 burner stove is mobil and can be taken out to cook outside. The interior was build as a Spirit Line product. 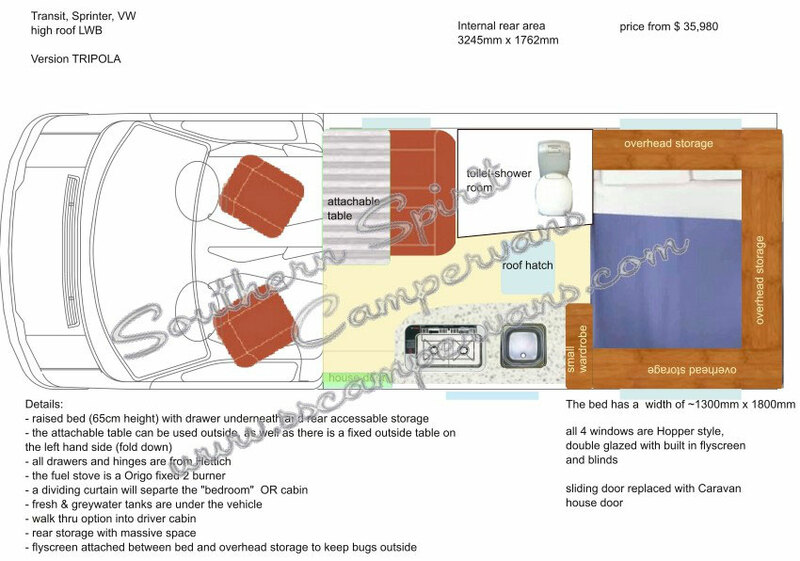 A basic camper or weekender perfect for young people or smaller budgets which represent our Running Free range. Heaps of storage, even surfboards can be carried easily. Good kitchen space with a top loader cooler for perfect access and a portable stove to have the option for cooking outside. Wardrobe space for all your clothes and a shelf for reach your everday gear. A double sized bed makes it suitable for couples and tall people. 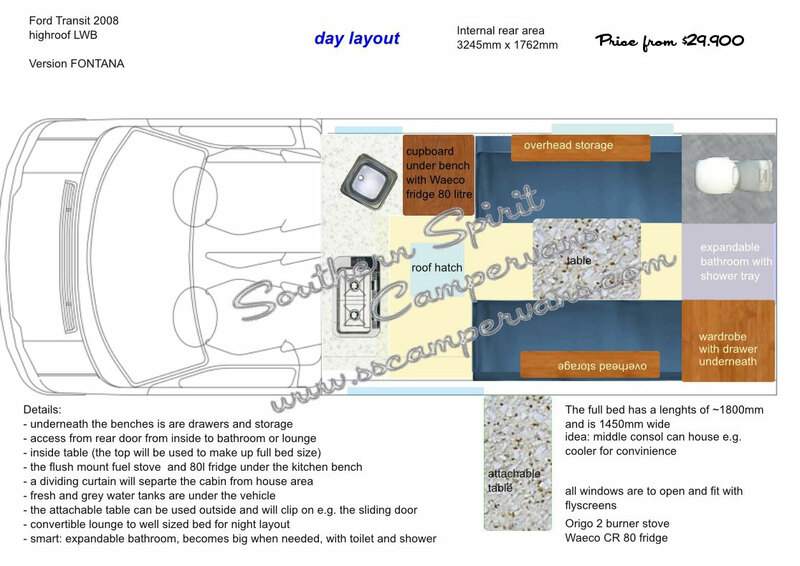 If you do not want to compromise in clever independency: included in this layout is a solar system, convertible bench to bed sleeping solution, a well sized kitchen and as a highlight a expandable bath room. You just use your bathroom with cassette toilet, shower and hot water when you do need it. NO claustrophobic toilet cubicles with narrow doors anymore. Also beneficial that you can enter your "bath room" from the rear- so you do not carry sand/dirt inside the whole living area. Designed for a standard long wheel base van of 3.2 -3.4m internal lenghts. Travelling together- but having a restful sleep in seperate beds. That's the slogan for this layout. 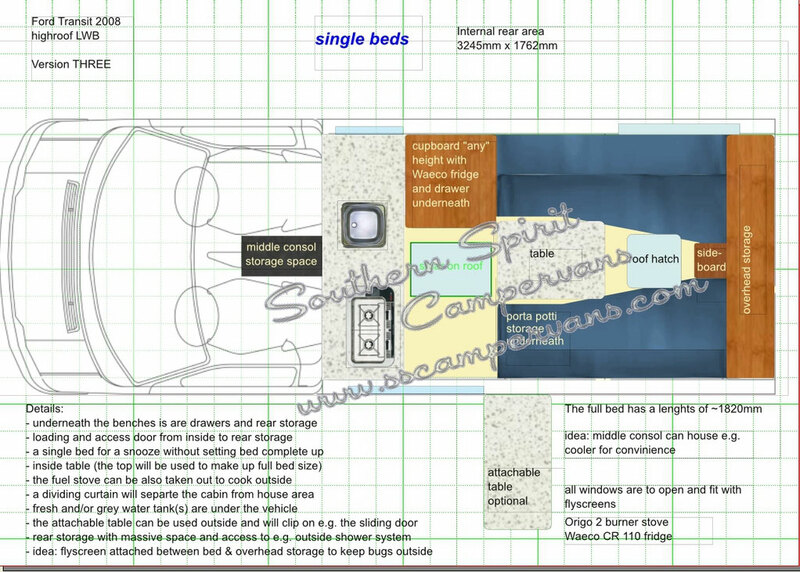 The beds a asymetric to make the most out of storage space and in the rear of the vehicle is a about average storage area. A portable loo can be easy stored away. The solar panel feeds not just the big 110l fridge. The stove is placed well to keep smell out when cooking with open sliding door. 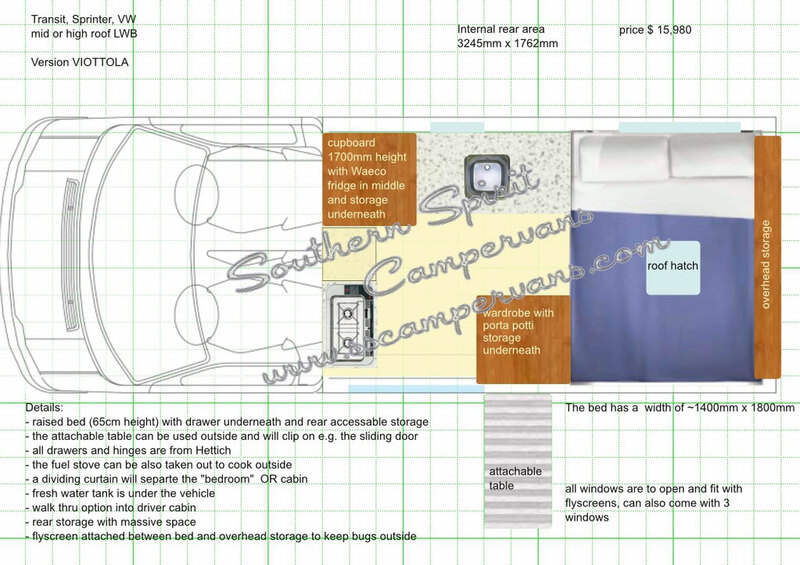 Also a walk thru layout can be designed with a passenger swivel seat and cooker next to passenger side bed.